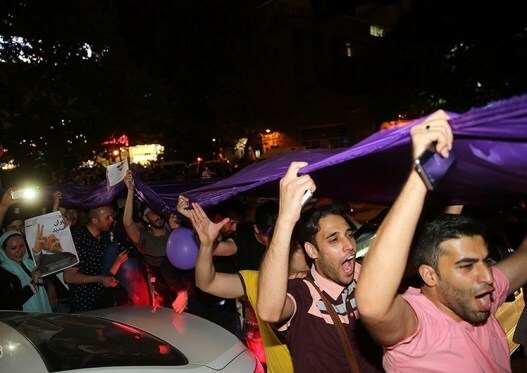 Iranian people came to streets to celebrate the victory of Hassan Rouhani, the moderate candidate in Iran’s twelfth presidential election. Rouhani secured 57% of the 40 million votes Iranian cast. He defeated the hardliner candidate Ebrahim Raisi, a former notorious prosecutor and jurist, who received 38.5% or 15.7 million of the votes. Zamaneh has reached a number of Iranian citizens via phone asking them about the outcome of the election, how they think Rouhani’s second term will play, and if their demands will be responded to. The celebrations for the victory in the presidential election started on noon Saturday 20th and continued to Sunday 21st – the day in which the results were out for the City and Village Councils election. 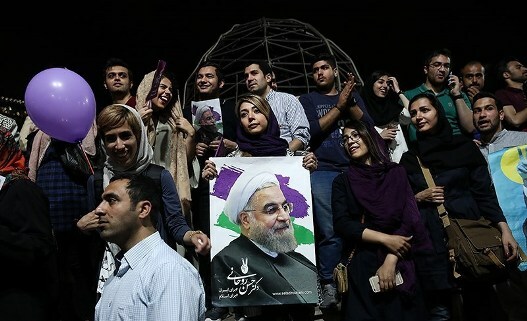 The reformist camp won most seats in Tehran, Mashhad, Tabriz, and other urban centers’ city councils. In Tehran the reformist and the centrist camp that is close to Rouhani won all 21 seats on the council. They had put out a list of recommended candidates called the Omid List (the List of Hope) and had asked voters to only vote for that list. The List of Hope defeated conservatives and hardliners that enjoyed a fourteen year reign of the very wealth city council and mayor’s office. The next fight is to replace Tehran’s mayor, Mohammad Bagher Ghalibaf, a conservative who was running against Rouhani in the presidential election but dropped out of the race to endorse Ebrahim Raisi. The city council members that the Tehranians elected have the power to replace the current mayor and it is likely that they will replace him. Among the winners of the City and Village Councils election all across Iran there are more than 420 woman; a favourable outcome for Iran’s women’s movement activist who were campaigning for more political participation and leadership of women. The votes are still being counted and not all the names of women elected are out. In 2011 leader of the Islamic Republic, Ayatollah Ali Khamenei extra-legally ordered the arrests of Green Movement leader Mehdi Karroubi, Mir Hossein Mousavi and Zahra Rahnavard. The leader has praised the voter turnout in the 2017 election and has thanked the presidential candidates but he has not congratulated Rouhani for winning the election. The clash is clear, the voters that voted for Rouhani do not all represent the group that submit to Khamenei under any circumstances. Saeed graduated from university ten years ago. it took him five years to secure a full time contract job. He had to work as a part-time inspector engineer and as a part-time taxi driver for five years. Even now he has to be away from his wife 14 days a month as his job is near the oil rigs in south of Iran. “We are still living in Maneli’s father’s basement. We cannot afford our own place. And we have a baby coming. These are the real problems.” Saeed says. In Mashad the story is different, the home city of the hardliner candidate Ebrahim Raisi did not fully support him. A very religious city where the shrine of the 8th Shiite Imam is located is living a cultural divide: the modern westernized Mashahdis do not get along with the religious ones who are part of the establishment and are limiting their freedoms. 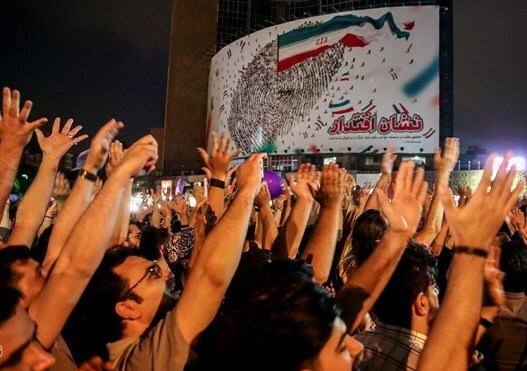 Including the freedom to attend concerts that are banned all together in the city of Mashhad. MirHabil on Twitter, however has another story. He is a green movement supporter who has voted for Rouhani but his father is a manual labourer who at the end of the day voted for Raisi. MirHabil is offended that many Rouhani supporters are mocking the likes of his father. On Twitter some conservative users agree with MirHabil that reformists are stuck up and elitist with no respect for boundaries of a Muslim culture. There are many tweets from Qom, Mashhad, Zanjan, Tehran where users are annoyed by the mixed gender dancing in the streets and the noise. Rouhani is promising to stand against war by advancing diplomatic relations. Hashemi who is active on social media and is from the city of Tabriz does not agree with Hassan that there is a common ground. He has voted for Raisi, despite the fact that most of his city supports Rouhani. One of Rouhani’s campaign slogans was “we will not go back” suggesting that Iran will go backwards with Raisi. However it also meant that “we will not go back to the time of sanctions and economic isolation”. Rouhani is promising an increase in foreign investment. Some Iranians boycotted the election. I call my uncle who has not voted in 30 years. He has lost a son in Iran’s notorious Evin prison; my cousin was executed as political prisoner when he was 23 years old. Ebrahim Raisi the hardliner judge and Rouhani’s rival was member of a special commission known as the “death committee” that ordered the executions of my cousin and 4000 or more prisoners. My cousin and his wife who live with my uncle have voted and are happy. They have a different perspective: “listen, can you hear, people are chanting and dancing, this is a blessing. This is the future of my son and my little daughter” my cousin’s wife, Vida says.